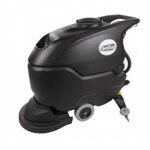 Take a look at our 15 inch floor buffer listed below for a machine to use with these stripping pads. They fit directly onto the bottom of the pad driver that comes with the buffer. The heavy machine helps apply pressure to the floor finish to help strip off all of the existing finish. Our Trusted Clean concentrated stripping solution is great stripper to use with these pads, and our buffer.